Robert C. Elliott died in 1981 in the very noon of is scholarship, just after completing his book The Literary Persona. He was the truest of teachers, the kindest of friends. This paper was prepared to be read as the first in a series of lectures at his college of the University of California, Sari Diego, honoring his memory. We use the French word lecture, “reading,” to mean reading and speaking aloud, a performance; the French call such a performance not a lecture but a conference. The distinction is interesting. Reading is a silent collaboration of reader and writer, apart; lecturing, a noisy collaboration of lecturer and audience, together. The peculiar patchwork form of this paper is my attempt to make it a “conference,” a performable work, a piece for voices. The time and place, a warm April night in La Jolla in 1982, are past, and the warm and noisy audience must be replaced by the gentle reader; but the first voice is still that of Bob Elliot. We shall be returning to both, never fear; what I am about here is returning. In the first chapter of The Shape of Utopia, Bob points out that in the great participatory festivals such as Saturnalia, Mardi Gras, or Christmas, the age of peace and equality, the Golden Age, may be lived in an interval set apart for it, a time outside of daily time. But to bring perfect communitas into the structure of ordinary society would be a job only Zeus could handle; or, “if one does not believe in Zeus’s good will, or even in his existence,” says Bob, it becomes a job for the mind of man. Now, the Golden Age, or Dream Time, is remote only from the rational mind. It is not accessible to euclidean reason; but on the evidence of all myth and mysticism, and the assurance of every participatory religion, it is, to those with the gift or discipline to perceive it, right here, right now. Whereas it is of the very essence of the rational or Jovian utopia that it is not here and not now. It is made by the reaction of will and reason against, away from, the here-and-now, and it is, as More said in naming it, nowhere. It is pure structure without content; pure model; goal. That is its virtue. Utopia is uninhabitable. As soon as we reach it, it ceases to be utopia. As evidence of this sad but ineluctable fact, may I point out that we in this room, here and now, are inhabiting utopia. I was told as a child, and like to believe, that California was named “The Golden State” not just for the stuff Sutter found but for the wild poppies on its hills and the wild oats of summer. To the Spanish and Mexicans I gather it was the boondocks; but to the Anglos it has been a true utopia: the Golden Age made accessible by willpower, the wild paradise to be tamed by reason; the place where you go free of the old bonds and cramps, leaving behind your farm and your galoshes, casting aside your rheumatism and your inhibitions, taking up a new “life style” in a not-here-not-now where everybody gets rich quick in the movies or finds the meaning of life or anyhow gets a good tan hang-gliding. And the wild oats and poppies still come up pure gold in cracks in the cement that we have poured over utopia. In “assuming the role of creator,” we seek what Lao Tzu calls “the profit of what is not,” rather than participating in what is. To reconstruct the world, to rebuild or rationalize it, is to run the risk of losing or destroying what in fact is. 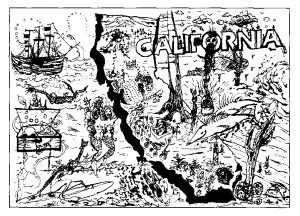 After all, California was not empty when the Anglos came. Despite the efforts of the missionaries, it was still the most heavily populated region in North America. What the Whites perceived as a wilderness to be “tamed” was in fact better known to human beings than it has ever been since: known and named. Every hill, every valley, creek, canyon, gulch, gully, draw, point, cliff, bluff, beach, bend, good-sized boulder, and tree of any character had its name, its place in the order of things. An order was perceived, of which the invaders were entirely ignorant. Each of those names named, not a goal, not a place to get to, but a place where one is: a center of the world. 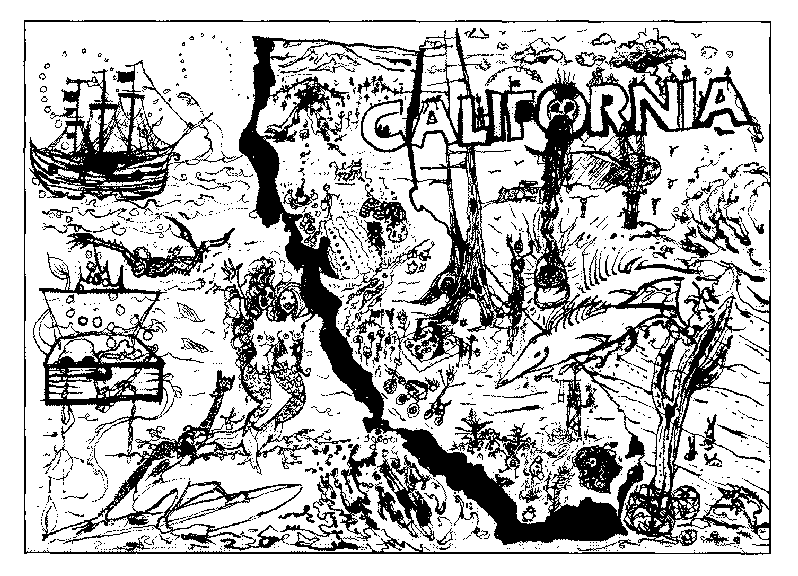 There were centers of the world all over California. One of them is a bluff on the Klamath River. Its name was Katimin. The bluff is still there, but it has no name, and the center of the world is not there. The six directions can meet only in lived time, in the place people call home, the seventh direction, the center. But we leave home, shouting Avanti! and Westward Ho!, driven by our godlike reason, which chafes at the limited, intractable, unreasonable present, and yearns to free itself from the fetters of the past. And when a future-oriented culture impinges upon a present-centered one, the method becomes a compulsion. Things are forgotten wholesale. What are the names “Costanoan,” “Wappo”? They are what the Spanish called the people around the Bay Area and in the Napa Valley, but what those people called themselves we do not know: the names were forgotten even before the people were wiped out. There was no past Tabula rasa. To whom was it not certain? But what the heathen know doesn’t count. Only if godlike Caesar sees it can Britannia rule the waves. Only if a European discovered or invented it could America exist. At least Columbus had the wit, in his madness, to mistake Venezuela for the outskirts of Paradise. But he remarked on the availability of cheap slave labor in Paradise. Professor Bean’s excellent book is superior to many of its kind in the area of my particular interest: the first chapter. Chapter One of the American history–South or North America, national or regional–is usually short. Unusually short. In it, the “tribes” that “occupied” the area are mentioned and perhaps anecdotally described. In Chapter Two, a European “discovers” the area; and with a gasp of relief the historian plunges into a narration of the conquest, often referred to as settlement or colonization, and the acts of the conquerors. Since history has traditionally been defined by historians as the written record, this imbalance is inevitable. And in a larger sense it is legitimate; for the non-urban peoples of the Americas had no history, properly speaking, and therefore are visible only to the anthropologist, not to the historian, except as they entered into White history. The imbalance is unavoidable, legitimate, and also, I believe, very dangerous. It expresses too conveniently the conquerors’ wish to deny the value of the cultures they destroyed, and dehumanize the people they killed. It partakes too much of the method of organized forgetting. To call this “the New World”–there’s a Caesarian birth! In order to speculate safely on an inhabitable future, perhaps we would do well to find a rock crevice and go backward. In order to find our roots, perhaps we should look for them where roots are usually found. At least the Spirit of Place is a more benign one than the exclusive and aggressive Spirit of Race, the mysticism of blood that has cost so much blood. With all our self-consciousness, we have very little sense of where we live, where we are right here right now. If we did, we wouldn’t muck it up the way we do. If we did, our literature would celebrate it. If we did, our religion might be participatory. If we did–if we really lived here, now, in this present–we might have some sense of our future as a people. We might know where the center of the world is. It was Arcadia, of course; it was not Elysium. I heed Victor Turner’s warning not to confuse archaic or primitive societies with the true communitas, “which is a dimension of all societies, past and present.” 10 I am not proposing a return to the Stone Age. My intent is not reactionary, nor even conservative, but simply subversive. It seems that the utopian imagination is trapped, like capitalism and industrialism and the human population, in a one-way future consisting only of growth. All I’m trying to do is figure how to put a pig on the tracks. Go backward. Turn and return. No other choice. Hear now the voice of Urizen! Of eternal brass, written in my solitude. The purer, the more euclidean the reason that builds a utopia, the greater is its self-destructive capacity. I submit that our lack of faith in the benevolence of reason as the controlling power is well founded. We must test and trust our reason, but to have faith in it is to elevate it to godhead. Zeus the Creator takes over. Unruly Titans are sent to the salt mines, and inconvenient Prometheus to the reservation. Earth itself comes to be the wart on the walls of Eden. The rationalist utopia is a power trip. It is a montheocracy, declared by executive decree, and maintained by willpower; as its premise is progress, not process, it has no habitable present, and speaks only in the future tense. And in the end reason itself must reject it. Heavens of my brain, nor will I look upon futurity more. That is certainly the high point of this paper. I wish we could follow Urizen in his splendid vertical jailbreak, but it is a route reserved to the major poets and composers. The rest of us must stay down here on the ground, walking in circles, proposing devious side trips, and asking impertinent questions. My question now is: Where is the place Coyote made? What do you do with her in Walden Two? Utopia has been euclidean, it has been European, and it has been masculine. I am trying to suggest, in an evasive, distrustful, untrustworthy fashion, and as obscurely as I can, that our final loss of faith in that radiant sandcastle may enable our eyes to adjust to a dimmer light and in it perceive another kind of utopia. As this utopia would not be euclidean, European, or masculinist, my terms and images in speaking of it must be tentative and seem peculiar. Victor Turner’s antitheses of structure and communitas are useful to my attempt to think about it: structure in society, in his terms, is cognitive, communitas existential; structure provides a model, communitas a potential; structure classifies, communitas reclassifies; structure is expressed in legal and political institutions, communitas in art and religion. Utopian thought has often sought to institutionalize or legislate the experience of communitas, and each time it has done so it has run up against the Grand Inquisitor. That is Fritjof Capra, providing another useful analogy. If the attempt to provide a structure that will ensure communitas is impaled on the horns of its own dilemma, might one not abandon the machine model and have a go at the organic–permitting process to determine structure? But to do so is to go even further than the Anarchists, and to risk not only being called but being in fact regressive, politically naive, Luddite, and anti-rational. Those are real dangers (though I admit that the risk of being accused of not being in the Main Current of Western Thought is one I welcome the opportunity to run). What kind of utopia can come out of these margins, negations, and obscurities? [i] Who will even recognize it as a utopia? It won’t look the way it ought to. It may look very like some kind of place Coyote made after having a conversation with his own dung. Paul Radin speaking. You will recall that the quality of static perfection is an essential element of the non-inhabitability of the euclidean utopia (a point that Bob Elliott discusses with much cogency). And he never was in Eden, because coyotes live in the New World. Driven forth by the angel with the flaming sword, Eve and Adam lifted their sad heads and saw Coyote, grinning. Non-European, non-euclidean, non-masculinist: they are all negative definitions, which is all right, but tiresome; and the last is unsatisfactory, as it might be taken to mean that the utopia I’m trying to approach could only be imagined by women–which is possible–or only inhabited by women–which is intolerable. Perhaps the word I need is yin. Utopia has been yang. In one way or another, from Plato on, utopia has been the big yang motorcycle trip. Bright, dry, clear, strong, firm, active, aggressive, lineal, progressive, creative, expanding, advancing, and hot. Our civilization is now so intensely yang that any imagination of bettering its injustices or eluding its self-destructiveness must involve a reversal. They return each to its root. To attain the constant, to end in order, we must return, go round, go inward, go yinward. What would a yin utopia be? It would be dark, wet, obscure, weak, yielding, passive, participatory, circular, cyclical, peaceful, nurturant, retreating, contracting, and cold. Now on the subject of heat and cold: a reference in The Shape of Utopia sent me to a 1960 lecture by M. Levi-Strauss, “The Scope of Anthropology,” which so influenced my efforts to think out this paper that I wish to quote from it at some length, with apologies to those of you to whom the passage 25 is familiar. He is speaking of “primitive” societies. Persevering in one’s existence is the particular quality of the organism; it is not a progress towards achievement, followed by stasis, which is the machine’s mode, but an interactive, rhythmic, and unstable process, which constitutes an end in itself. Levi-Strauss is about to make his distinction between the “hot” societies, which have appeared since the Neolithic Revolution, and in which “differentiations between castes and between classes are urged without cease, in order that social change and energy may be extracted from them,” and the “cold” societies, self-limited, whose historical temperature is pretty near zero. If I understand him, this unification would involve carrying the Industrial Revolution, already the principal source of social energy, to its logical extreme: the completed Electronic Revolution. After this, change and progress would be strictly cultural and, as it were, machine-made. The last phrase, from that austere and somber mind, is poignant. As I understand it, Levi-Strauss suggests that to combine the hot and the cold is to transfer mechanical operational modes to machines while retaining organic modes for humanity. Mechanical progress; biological rhythm. A kind of super-speed electronic yang train, in whose yin pullmans and dining cars life is serene and the rose on the table does not even tremble. What worries me in this model is the dependence upon cybernetics as the integrating function. Who’s up there in the engineer’s seat? Is it on auto? Who wrote the program old Nobodaddy Reason again? Is it another of those trains with no brakes? It may simply be the bad habits of my mind that see in this brief utopian glimpse a brilliant update of an old science-fiction theme: the world where robots do the work while the human beings sit back and play. These were always satirical works. The rule was that either an impulsive young man wrecked the machinery and saved humanity from stagnation, or else the machines, behaving with impeccable logic, did away with the squashy and superfluous people. The first and finest of the lot, E.M. Forster’s “The Machine Stops,” ends on a characteristic double chord of terror and promise: the machinery collapses, the crystalline society is shattered with it, but outside there are free people–how civilized, we don’t know, but outside and free. We’re back to Kundera’s wart on the walls of Eden–the exiles from paradise in whom the hope of paradise lies, the inhabitants of the gulag who are the only free souls. The information systems of the train are marvelous, but the tracks run through Coyote country. Having copied out this sentence, I obeyed, letting my understanding rest in what it could not understand, and went to the I Ching. I asked that book please to describe a yin utopia for me. It replied with Hexagram 30, the doubled trigram Fire, with a single changing line in the first place taking me to Hexagram 56, the Wanderer. The writing of the rest of this paper and the revisions of it were considerably influenced by a continuing rumination of those texts. If utopia is a place that does not exist, then surely (as Lao Tzu would say) the way to get there is by the way that is not a way. And in the same vein, the nature of the utopia I am trying to describe is such that if it is to come, it must exist already. I believe that it does: [iii] most clearly as an element in such deeply unsatisfactory utopian works as Hudson’s A Crystal World or Aldous Huxley’s Island. Indeed Bob Elliot ended his book on utopia with a discussion of Island. Huxley’s “extraordinary achievement,” he says,”is to have made the old utopian goal–the central human goal–thinkable once more.” 28 Those are the last words of the book. It is very like Bob that they should be not the closing but the opening of a door. The major utopic element in my novel The Dispossessed is a variety of pacifist anarchism, which is about as yin as a political ideology can get. Anarchism rejects the identification of civilization with the state, and the identification of power with coercion; against the inherent violence of the “hot” society it asserts the value of such antisocial behavior as the general refusal of women to bear arms in war; and other coyote devices. In these areas anarchism and Taoism converge both in matter and manner, and so I came there to play my fictional games. The structure of the book may suggest the balance-in-motion and rhythmic recurrence of the Tai Chi, but its excess yang shows: though the utopia was (both in fact and and in fiction) founded by a woman, the protagonist is a man; and he dominates it in, I must say, a very masculine fashion. Fond as I am of him, I’m not going to let him talk here. I want to hear a different voice. This is Lord Dorn, addressing the Council of his country, on June 16, 1906. He is talking not to, but about, us. Now, this speech might have been made in the council of any non-Western nation or people at the time of its encounter with Europeans in numbers. This could be a Kikuyu talking, or a Japanese–and certainly Japan’s decision to Westernize was in the author’s mind–and it is almost painfully close to the observations of Black Elk, Standing Bear, Plenty-Coups, and other native North American spokesmen. Islandia is not a hot but a warm society: it has a definite though flexible class hierarchy, and has adopted some elements of industrial technology; it certainly has and is conscious of its history, though it has not yet entered into world history, mainly because, like California, it is geographically marginal and remote. In this central debate at the Council of Islandia, the hinge of the book’s plot and structure, a deliberate choice is made to get no hotter: to reject the concept of progress as a wrong direction, and to accept persevering in one’s existence as a completely worthy social goal. In how many other utopias is this choice rationally propounded, argued, and made? It is easy to dismiss Islandia as a mere fantasy of the Golden Age, naively escapist or regressive. I believe it is a mistake to do so, and that the options it offers are perhaps more realistic and more urgent than those of most utopias. “The reality of a virus is almost of an intellectual order. In effect, its organism is reduced practically to the genetic formula that it injects into simple or complex beings, thus forcing their cells to betray their characteristic formula in order to obey its own and to manufacture beings like itself. This is the virus that Lord Dorn saw carried by the most innocent tourist from Europe or the United States: a plague against which his people had no immunity. Was he wrong? Any small society that tried to make Lord Dorn’s choice has, in fact, been forcibly infected; and the big, numerous civilizations–Japan, India, and now China–have either chosen to infect themselves with the viral fever or have failed to make any choice, all too often mixing the most exploitive features of the hot world with the most passive of the cold in a way that almost guarantees the impossibility of their persevering in their own existence or allowing local nature to continue in health. I wanted to speak of Islandia because I know no other utopian work that takes for its central intellectual concern this matter of “Westernization” or “progress,” which is perhaps the central fact of our times. Of course the book provides no answer or solution; it simply indicates the way that cannot be gone. It is an enantiodroma, a reculer pour mieux sauter, a porcupine backing into a crevice. It goes sideways. That’s very likely why it gets left out of the survey courses in Utopian Lit. But side trips and reversals are precisely what minds stuck in forward gear most need, and in its very quality of forswearing “futurity,” of standing aside–and of having been left aside–Islandia is, I suggest, a valuable as well as an endearing book. It is to some degree a Luddite book as well; and I am forced now to ask: Is it our high technology that gives our civilization its invasive, self-replicating, mechanical forward drive? In itself, and technology is “infectious” only as other useful or impressive elements of culture are; ideas, institutions, fashions too, may be self-replicating and irresistibly imitable. Obviously, technology is an essential element of all cultures and very often, in the form of potsherds or bits of styrofoam, all they leave behind in time. It is far too basic to all civilization to be characterized in itself as either yin or yang, I think. But at this point, here and now, the continuously progressing character of our technology, and the continuous change that depends upon it–“the manufacture of progress,” as Levi-Strauss called it–is the principal vehicle of the yang, or”hotness,” of our society. One need not smash one’s typewriter and go bomb the laundromat, after all,because one has lost faith in the continuous advance of technology as the way towards utopia. Technology remains, in itself, an endless creative source. I only wish that I could follow Levi-Strauss in seeing it as leading from the civilization that turns men into machines to “the civilization that will turn machines into men.” 31 But I cannot. I do not see how even the almost ethereal technologies promised by electronics and information theory can offer more than the promise of the simplest tool: to make life materially easier, to enrich us. That is a great promise and gain! But if this enrichment of one type of civilization occurs only at the cost of the destruction of all other species and their inorganic matrix of earth, water, and air, and at increasingly urgent risk to the existence of all life on the planet, then it seems fairly clear to me that to count upon technological advance for anything but technological advance is a mistake. I have not been convincingly shown, and seem to be totally incapable of imagining for myself, how any further technological advance of any kind will bring us any closer to being a society predominantly concerned with preserving its existence; a society with a modest standard of living, conservative of natural resources, with a low constant fertility rate and a political life based upon consent; a society that has made a successful adaptation to its environment and has learned to live without destroying itself or the people next door. But that is the society I want to be able to imagine–I must be able to imagine, for one does not get on without hope. What are we offered by way of hope? Models, plans, blueprints, wiring diagrams. Prospects of ever more inclusive communications systems linking virus to virus all over the globe–no secrets, as Kundera says. Little closed orbiting test-tubes full of viruses, put up by the L-5 Society, in perfect obedience to our compulsion to, as they say, “build the future”–to be Zeus, to have power over what happens, to control. Knowledge is power, and we want to know what comes next, we want it all mapped out. Coyote country has not been mapped. The way that cannot be gone is not in the road atlas, or is every road in the atlas. The euclidean utopia is mapped; it is geometrically organized, with the parts labeled a, a, b: a diagram or model, which social engineers can follow and reproduce. Reproduction, the viral watchword. “The only societies were those of the town unit. They were not branches, because there was no parent stem. Our method, in any such situation, religious or otherwise, is to constitute a central and superior body. Since the day of the Roman empire and the Christian church, we hardly think of a social activity except as it is coherently Organized into a definite unit definitely subdivided. “But, it must be recognized that such a tendency is not an inherent and inescapable one of all civilization. If we are able to think socially only in terms of an organized machine, the California native was just as unable to think in those terms. Copernicus told us that the earth was not the center. Darwin told us that man is not the center. If we listened to the anthropologists we might hear them telling us, with appropriate indirectness, that the White West is not the center. The center of the world is a bluff on the Klamath River, a rock in Mecca, a hole in the ground in Greece, nowhere, its circumference everywhere. Perhaps the utopist should heed this unsettling news at last. Perhaps the utopist would do well to lose the plan, throw away the map, get off the motorcycle, put on a very strange-looking hat, bark sharply three times, and trot off looking thin, yellow, and dingy across the desert and up into the digger pines. I don’t think we’re ever going to get to utopia again by going forward, but only roundabout or sideways; because we’re in a rational dilemma, an either/or situation as perceived by the binary computer mentality, and neither the either nor the or is a place where people can live. Increasingly often in these increasingly hard times I am asked by people I respect and admire, “Are you going to write books about the terrible injustice and misery of our world, or are you going to write escapist and consolatory fantasies?” I am urged by some to do one–by some to do the other. I am offered the Grand Inquisitor’s choice. Will you choose freedom without happiness, or happiness without freedom? The only answer one can make, I think, is: No. Back round once more. Usa puyew usu wapiw! Sounds like Coyote to me. Falls into things, traps, abysses, and then clambers out somehow, grinning stupidly. Is it possible that we are in fact no longer confronting the Grand Inquisitor? Could he be the Father Figure whom we have set up before us? Could it be that by turning around we can put him behind us, and leave him staring like Ozymandias King of Kings out across the death camps, the gulags, the Waste Land, the uninhabitable kingdom of Zeus, the binary-option, single-vision country where one must choose between happiness and freedom? If so, then we are in the abyss behind him. Not out. A typical Coyote predicament. We have got ourselves into a really bad mess and have got to get out; and we have to be sure that it’s the other side we get out to; and when we do get out, we shall be changed. I have no idea who we will be or what it may be like on the other side, though I believe there are people there. They have always lived there. It’s home. There are songs they sing there; one of the songs is called “Dancing at the edge of the world.” If we, clambering up out of the abyss, ask questions of them, they won’t draw maps, alleging utter inability; but they may point. One of them might point in the direction of Arlington, Texas. I live there, she says. See how beautiful it is! This is the New World! we will cry, bewildered but delighted. We have discovered the New World! Oh, no, Coyote will say. No, this is the old world. The one I made. You made it for us! we will cry, amazed and grateful. I wouldn’t go so far as to say that, says Coyote. “A Non-Euclidean View of California As A Cold Place to Be” from Dancing at the Edge of the World by Ursula K. Le Guin, Copyright (c) 1989 by Ursula K. Le Guin. Used by permission of Grove/Atlantic, Inc.
2. Ibid., pp. 8, 9. 3. Milan Kundera, The Book of Laughter and Forgetting, trans. Michael Henry Heim (New York Penguin Books, 1981), p. 22. 5. Walton Bean, California: An Interpretive History (New York: McGraw-Hill, 1968), p. 4. 6. Howard A. Norman, introduction to The Wishing Bone Cycle (New York: Stonehill Publishing Co., 1979). 10. Victor W. Turner, The Ritual Process: Structure and Anti-Structure (Chicago: Aldine Publishing Co., 1969), p. 129. 14. William Blake, The Book of Urizen, lines 52-55, 75-84. 16. Lao Tzu, Tao Teh Ching, Book II, Chapter 38. 17. William Blake, The Marriage of Heaven and Hell, Book III, Proverbs of Heaven and Hell, line 21. 19. William Blake, Vala, or the Four Zoas, Book IX, lines 162-167, 178-181, 186, 189-191. 20. Kenneth Roemer, “Using Utopia to Teach the Eighties,” World Future Society Bulletin (July-August 1980). 22. Fritjof Capra, The Turning Point (New York: Simon & Schuster, 1982). Excerpted in Science Digest (April 1982), p. 30. 23. Paul Radin, The Trickster (New York: Philosophical Library, 1956), p. 168. 24. Lao Tzu, Book I, Chapter 16. 25. Claude Levi-Strauss, The Scope of Anthropology (London: Jonathan Cape, 1968), pp. 46-47. Also included in Structural Anthropology II (New York: Basic Books, 1976), pp. 28-30. The version here is my own amalgam of the two translations. 26. The Complete Works of Chuang Tzu, trans. Burton Watson (New York: Columbia University Press, 1968), p. 116. 29. Austin Tappan Wright, Islandia (New York: Alfred A. Knopf, 1942), p. 490. 30. Levi-Strauss, “Art in 1985,” in Structural Anthropology II, p. 283. 31. Levi-Strauss, Scope of Anthropology, p. 49. 32. Alfred L. Kroeber, Handbook of the Indians of California, Smithsonian Institution, Bureau of American Ethnology Bulletin no. 78 (Washington, D.C., 1925), p. 344.
i: When I was struggling with the writing of this piece, I had not read the four volumes of Robert Nichols’ Daily Lives in Nghsi-Altai (New York: New Directions, 1977-79). I am glad that I had not, because my thoughts could not then have so freely and fecklessly coincided, collided, and intersected with his. My paper would have been written in the consciousness of the existence of Nghsi-Altai, as Pierre Menard’s Quixote was written in the consciousness of the existence of Cervantes’ Quixote, and might have been even more different from what it is than Menard’s Quixote from Cervantes’. But it can be and I hope will be read in the consciousness of the existence of Nghsi-Altai; and the fact that Nghsi-Altai is in some respects the very place I was laboriously trying to get to, and yet lies in quite the opposite direction, can only enlarge the use and meaning of my work. Indeed, if this note leads some readers to go find Nghsi-Altai for themselves, the whole thing will have been worthwhile. ii: “Heaven the Equalizer” was translated by James Legge as “the Lathe of Heaven,” a fine phrase, from which I have got considerable mileage; but Joseph Needham has gently pointed out to me that when Chuang Tzu was writing the Chinese had not yet invented the lathe. Fortunately we now have Burton Watson’s wonderfully satisfying translation to turn to.